First off, my first quilt is coming along, somewhat nicely. I used to think that quilting was boring and had this preconceived notion that since I knew a bit about sewing, that I could easily make an extravagant quilt. Yes, I was wrong. It's hard, bulky, and I realized I can't sew in a straight line for too long. I also need to purchase some supplies and am using my previous posts (essentials for sewing) as a list. Now I have a question for you. What should my next project be? Should I make another quilt? A bag? Should I stop now while I'm still ahead?! Please let me know and leave any tutorials you might have in your back pocket! Those could help a girl like me out. Thanks so much! I found this awesome tutorial. Do you like cats? 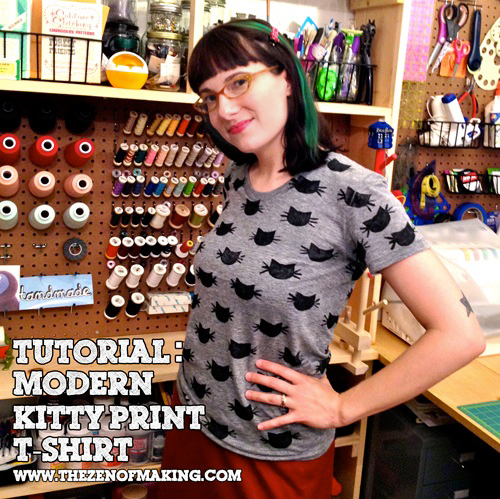 I'm more of a dog person but that doesn't stop me from loving this tutorial from the blog, The Zen of Making, on making your own printed fabric! She made hers into a cat but imagine being able to make one for a dog paw, a fish, or even just fun lightening bolts. It'd be a great gift to give someone. Now if you didn't want to print cats but wanted cat fabric, I found these for you! The turquoise is by Michael Miller while the Halloween one is by In the Beginning. This next tutorial is from the blog The Handmade Home and is simply divine! These easy to make pillows are unique, youthful, and fun! Check out the blog. We also just got new fabric in! I really want to make something with this one. It's just so clean, simple, and attractive! I love the pop of yellow this could add to a project. It's by Riley Blake and is called Pop Yellow, one of my favorites when it comes to fabric designs. This next one is a beautiful polka dotted design. We've got lots of new polka dot fabric but I just love how nice the white dots look on the blue! It's also by Riley Blake. This one is from the Summerhome Collection designed by Kathy McGee. It's just lovely and whimsical with a playfulness that could work in any project like a quilt or even a skirt! Well, that's it for me. Now it's back to waiting for sweet freedom into the weekend. Please follow us on Twitter, Pinterest, Facebook and/or comment below on things you'd like me to feature or talk about! Thanks!